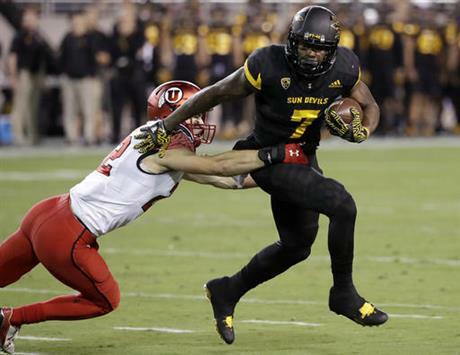 TEMPE, Ariz. (AP) — Joe Williams ran for 181 yards and two touchdowns, and No. 13 Utah’s defense had 11 sacks in a 49-26 victory over Arizona State on Thursday night. Utah (8-2, 5-2 Pac-12, No. 15 CFP) overcame a slow start with a series of spectacular plays against the FBS’ worst passing defense to end an eight-game losing streak in Tempe. Troy Williams threw for 296 yards and connected with Raelon Singleton on three of his four touchdown passes. Singleton finished with 116 yards on four catches to help the Utes stay within reach of No. 16 Colorado in the Pac-12 South. Utah was concerned about Arizona State’s attacking defense, but the Utes were the ones putting on all the pressure. Hunter Dimick sacked Manny Wilkins five times and the Utes had 22 tackles for loss. 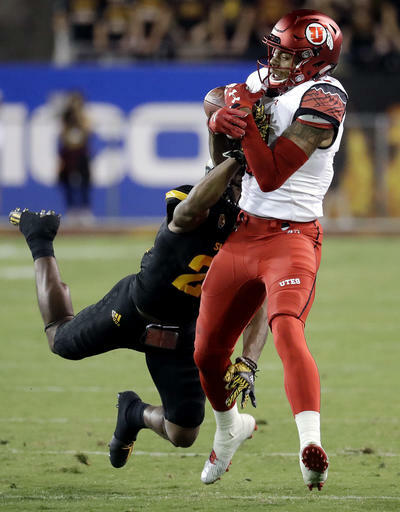 The Utes rallied from an early 13-0 deficit to beat ASU for their first win in Tempe since 1976. Marcus Williams made his return after sitting with an injury in high fashion, grabbing an interception, his fourth of the season, in the Sun Devils’ end zone on the opening drive. Utah was unable to take advantage of the defensive effort, turning the ball over twice on its first two drives. Arizona State (5-5, 2-5 Pac-12) got on the board first on a field goal from kicker Zane Gonzales for a 3-0 lead in the opening period. The Sun Devils continued their offensive push taking a 10-0 lead after Kalen Ballage exploded on a 62-yard run. Another field goal made it 13-0 by the end the first quarter. T. Williams connected on a 64-yard pass to Singleton to get the Utes on the board. With the pass, T. Williams leads the Pac-12 with 11 completions of 40-plus yards. The Utes took a 14-13 lead on a 27-yard pass to freshman Siaosi Wilson and subsequent extra point with 10:13 to play in the second quarter. Arizona State regained the lead, 20-14, on a broken play with 3:36 to play in the first half. T. Williams connected again with Singleton in the end zone, as the Utes took a 21-20 edge into the break. J. Williams ran the ball on an 82-yard touchdown run and the Utes picked up another good extra point leading 28-20. The Sun Devils found the end zone with 2:20 to play in the third quarter, but failed on a 2-point conversion to leave the Utes in the lead, 28-26. Singleton scored his third touch down of the game early in the fourth quarter on a 24-yard pass and a 35-26 lead. The Ute defense picked up a pick six as sophomore defensive back Chase Hansen grabbed an interception. J. Williams picked up his second touchdown of the game in the fourth quarter as the Utah extended its lead 49-26 over Arizona State. Utah has three conference games remaining in the regular season with a chance to take the Pac-12 South. Utah’s defense was at its harassing best and its offense had a nice balance, setting the Utes up nicely for the season’s final two games. Arizona State got a spark from Wilkins’ return, but couldn’t protect him or stop giving up big plays on defense. The Sun Devils need to win one of their final two games to become bowl eligible. Utah hosts Oregon next Saturday before playing at No. 16 Colorado in a potential showdown for the Pac-12 South title. Arizona State hosts No. 4 Washington next Saturday before playing at rival Arizona in its regular-season finale.